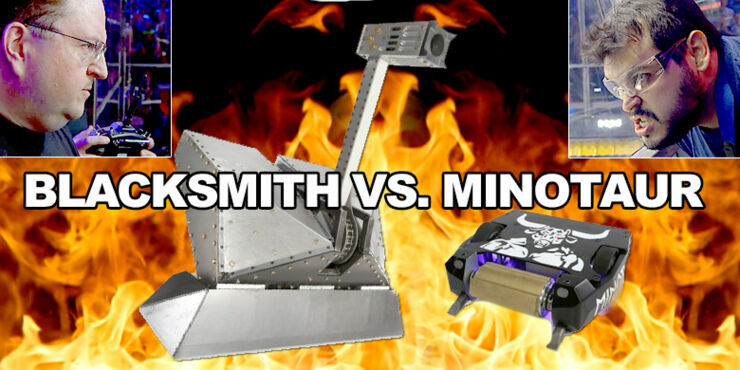 The second season of the BattleBots reboot saw one of the most amazing and brutal matches ever in the history of the TV series when the metal giant Blacksmith, a menacing hulk of a robot built by Al Kindle, took on the brave, but mini Minotaur built by Brazilian Team RioBotZ. This was a real 'David and Goliath' type of story, except in this version it definitely looked as if poor David was destined for the BattleBot scrapheap. You got the feeling that it was going to get ugly very quickly. Even if you're not a fan of small wheeled robots doing battle, you can't deny the entertainment factor of this intense fight. Sparks fly, robots are launched into the air after colliding, and it all ends with one of the bots in flames. It's about as close as we will ever get to the thrill of Roman gladiators doing battle in the arena. Part of the appeal is the arsenal of weapons the bots are equipped with. Blacksmith has a huge flame-throwing hammer that's probably, for sheer spectacle, one of the most enjoyable weapons to watch as it comes crashing down on its opponents like some kind of Mad Max roomba. However, Minotaur's secret weapon is a cunning, lethal spinning drum which can whizz round at 10,000 RPM and send any unfortunate robot who comes into contact with it hurtling 50 yards. It turns out that David does prevail after all, Minataur's weapon is so powerful and effective it's amazing to see the deadly damage it does to an Blacksmith in the video. And out of the two weapons it's definitely the more fatal. Because while Blacksmith's hammer looks like it could inflict some devastation, in actuality it's no match for the might of the Minataur. The ending is like something out of a Rocky film with the bigger opponent finally getting his comeuppance. It's brutal, nasty and slightly sad to watch. But wonderful entertainment. Whoever has to face Minotaur next, be afraid. Be very afraid.